India is aspiring to become a developed country. There are many ways to measure the “development” of a country, access to basic amenities is one of them. So a relevant question today would be, what is the status of basic amenities in India, or, what needs to be done with the basic amenities for the people so that India can become a better country? This post intends to propose an answer to these questions. Please note that SC means Scheduled Castes and ST means Scheduled Tribes. What does the infographic say? Broadly, two things. 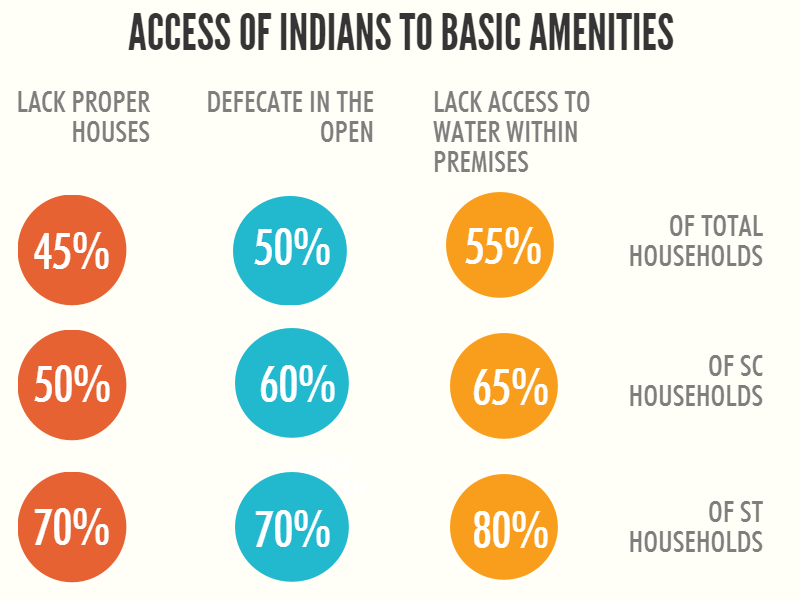 First, nearly half of the Indians lack basic amenities. Second, the situation of ST and SC households is worse than that of the total population. This is not a situation in which a country on the path of development wants to be in. Economic growth, more industries, more airports, international trade, all are good but India must also make sure that all the people have access to the most basic amenities. Development has to be inclusive, meaning life should become better for even the most disadvantaged sections of people such as the STs. I have italicized the word “inclusive” in the paragraph above because it is an important term in development theories now. In very crude terms, it means economic growth that benefits even the poorest in a society. This has caught the attention of the world because there has been a strong critique that economic growth benefits only the middle and higher income people, not the poor. Click here for a better and short introduction to the concept of inclusive growth. The infographic above was created using Piktochart, a free online infographics-creating platform. Infographics are powerful tools to present data and convey ideas, and are widely used in presentations today. I have made a very simple graphic here, there are lot more creative ways in which one can make them. Click here to go to Piktochart. Checking out other similar infographics tools also would be a cool idea. Next Next post: What is happening with Greece?